Any student of physiology is thoroughly familiar with Pavlov’s original work on classical conditioning, which was carried out in the 1900’s and established the concept of associative learning. 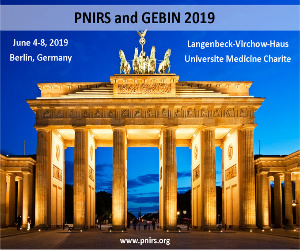 Less well-known, however, are the implications this paradigm had for the study of neuro-immune interactions, a direction first notably pursued by Serguei Metalnikov at the Pasteur Institute. Metalnikov (1870-1946) was trained as a zoologist at the University of St. Petersburg. After pursuing further studies in Heidelberg and Naples, he spent some time in Metchnikoff’s laboratory at the Pasteur Institute working on the immunogenicity of spermatotoxins . A few years after returning to Russia in 1902, he became a professor at the University of St. Petersburg and then head of the St. Petersburg Biological Institute in 1910. It was in 1919 that he relocated to the Pasteur Institute in France and began his work on defense reactions in invertebrates, a project he pursued until his death in 1946 and which earned him repute as a pioneer in insect immunity . His work on insect immunity had practical applications – understanding the interactions between invertebrate hosts and parasites could suggest methods for eliminating harmful insects . However, through this work Metalnikov also hoped to provide clues to immune responses in higher organisms and investigate the interface between immune and neurological reactions to external stimuli . In a 1921 paper, he reported that ligatures applied to Galleria mellonela larvae did not inhibit antibody production unless ganglia were targeted, thus interrupting neural transmission . In a later study, he selectively cauterized specific portions of the larvae’s nervous system and then injected heat-treated Vibrio cholerae. After this ‘immunization’, most insects could survive viable Vibrio cholerae challenges despite ganglion destruction. However, if the third thoracic ganglion had been cauterized, insects quickly died of septicemia . These experiments reinforced to Metalnikov the intimate interaction between the immune and nervous systems; he even stated, “To immunize is mainly to immunize the nervous centers which govern the cells’ sensitivity” . He was thus inspired to more definitively demonstrate this interrelationship and “proposed linking immunological and neurological reactions through the concept of a conditioned reflex” , now termed neuro-immune associative learning. Metalnikov saw immunity as embedded in evolution – and from an evolutional standpoint, neuro-immune associative learning simply makes sense, as a way of preemptively and efficaciously responding to potentially deadly infectious agents. To demonstrate the presence of a conditioned reflex in immune responses, he and his collaborator Victor Chorine used guinea pig and rabbit models in experiments closely based on the Pavlovian paradigm. In the initial series, guinea pigs received intraperitoneal injections of tapioca or killed Bacillus anthracis (unconditioned stimulus, UCS), paired with scratching or heat applied to a small area of skin (conditioned stimulus, CS) . The injection of foreign material would produce the unconditioned response, UCR – a shift in the leukocytic profile of the peritoneal fluid from a mononuclear to polymorphonuclear (PMN) leukocyte predominance. The UCS and CS were presented to the animals daily for 18-25 days, then followed by a 12-15 day rest period which allowed the peritoneal exudate to return to baseline. Upon presentation of the CS alone, conditioned animals experienced rapid increases in PMNs. For example, in one animal, initial injection of foreign material produced up to 90% PMN 5 hours post-injection, whereas CS alone after conditioning produced a change from 0.6% at baseline to 62% within 5 hours [7,8]. Interestingly, Metalnikov and Chorine also suggested that conditioned stimuli could enhance resistance to infection. Guinea pigs received multiple pairings of CS as above and intraperitoneal injection of staphylococcal filtrate (UCS) followed by a rest period. Animals were then exposed to the CS several times and a lethal dose of Vibrio cholerae culture was administered. Animals conditioned and reexposed to the CS prior to infection survived, whereas control animals – either not at all conditioned or conditioned but not reexposed to the CS – died [7,8]. In yet another approach to the question of immune reflexes, Metalnikov and Chorine observed the effect on antibody levels when a protocol similar to the original was utilized. Rabbits repetitively received heat or a scratch (CS) along with an emulsion of Vibrio cholerae (UCS), rested for three weeks, and then were reexposed to the CS or served as controls. Antibody titers consistently showed demonstrable increases in reexposed animals as compared to controls. A similar pattern was observed when the CS used was a trumpet sound [8,9,10]. As Ader describes in a 1981 historical review, by today’s standards, Metalnikov and Chorine’s works were limited by small sample sizes and noncomprehensive description of methods and results . However, subsequent studies by other groups – Nicolau and Antinescu-Dimitriu in 1929, Ostravskaya in 1930, and others – soon replicated the results, with larger sample sizes and improved control of environmental factors [8,11]. Nevertheless, the scientific community largely rejected the notion that immune responses could be conditioned and interest faded for about half a century . In 1975, Ader and Cohen were conducting taste aversion studies with saccharine (CS) and cyclophosphamide (UCS) and serendipitously realized that a conditioned response of immunosuppression resulted . Their work set the stage for the modern study of psychoneuroimmunology and prompted a bonanza of reports linking various exteroceptive stimuli with immunomodulation, summarized succinctly by Niemi et al. in 2008  and, even more recently by Schedlowski et al. in 2010 . Metalnikov and Chorine’s original experiments undoubtedly provided a foundation for investigating the fascinating phenomenon of neuro-immune associative learning and intrigued modern researchers when the experiments were revisited in late 1970’s. Along with the other scientists featured in the History section of this website, Metalnikov demonstrated the exceptionally innovative and critical mindset that allowed a multifaceted field linking neuroscience, endocrinology, and immunology to be born. Metalnikov S. The reflex as a creative act. Russkaya Misl 1916 Nov; p.98. Cited in Bekhterev V. General principles of human reflexology. New York: Arno Press 1973: 111. Brey PT. Studies on insect immunity at the Institut Pasteur (1920-1935). In Molecular mechanisms of immune responses in insects. London: Chapman & Hall 1998: 1-39. Lowy I. On guinea pigs, dogs and men: anaphylaxis and the study of biological individuality, 1902–1939. Stud Hist Phil Biol & Biomed Sci 2003; 34: 399–423. Metalnikov S. L’immunité naturelle et acquise chez la chenille de Galleria melonella. Annales de l’Institut Pasteur 1921; 35: 363-377. Metalnikov S. Phagocytose et reactions des cellules dans l’immunité. Annales de l’Institut Pasteur 1924; 38: 787-826. Metalnikov S. Le role de système nerveux et des facteurs biologiques et psychiques dans l’immunité. Paris: Masson 1932: 166. 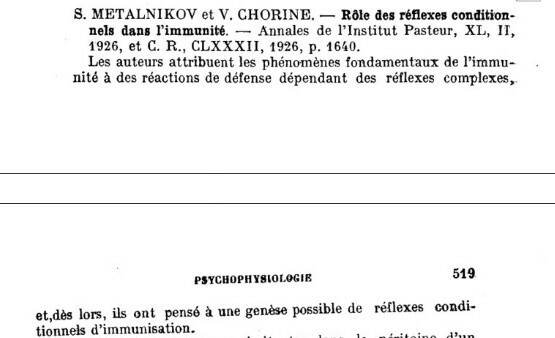 Metalnikov S, Chorine V. Rôle des reflexes conditionnels dans l’immunité. Annales de l’Institut Pasteur 1926; XL, II. Ader, R. A historical account of conditioned immunobiologic responses. In Psychoneuroimmunology. New York: Academic Press 1981:321–354. Metalnikov S, Chorine V. Rôle des reflexes conditionnels dans la formation des anticorps. CR Societé de Biologie 1928; 99: 142–145. Metalnikov S, Chorine V. Études sur le rôle des reflexes conditionnels dans l’immunité. Zeitschrift für Immunitätsforschung 1928; 57: 326–336. Niemi MB, Pacheco-Lopez G, Engler H, Riether C, Doenlen R, Schedlowski M. Neuro-immune associative learning. In Handbook of Neurochemistry and Molecular Neurobiology: Neuroimmunology. New York: Springer Science+Business Media, LLC 2008: 123-150. Ader R. On the development of psychoneuroimmunology. European Journal of Pharmacology 2000; 405: 167–176. Schedlowski M, Pacheco-López G. The learned immune response: Pavlov and beyond. 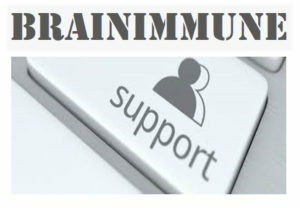 Brain, Behavior, and Immunity 2010; 24: 176–185.